December 6, 2018 (Investorideas.com Newswire) This Canada-based exploration company makes headway in southeastern Peru as it completes a major milestone and releases more information on its biggest projects. Palamina Corp. (PA:TSX.V; PLMNF:OTC.MKTS), a Canada-based precious metals exploration company, released information about developments that could propel the company forward. According to the company, Palamina is looking for the hard rock source of a modern day gold rush underway in Peru. 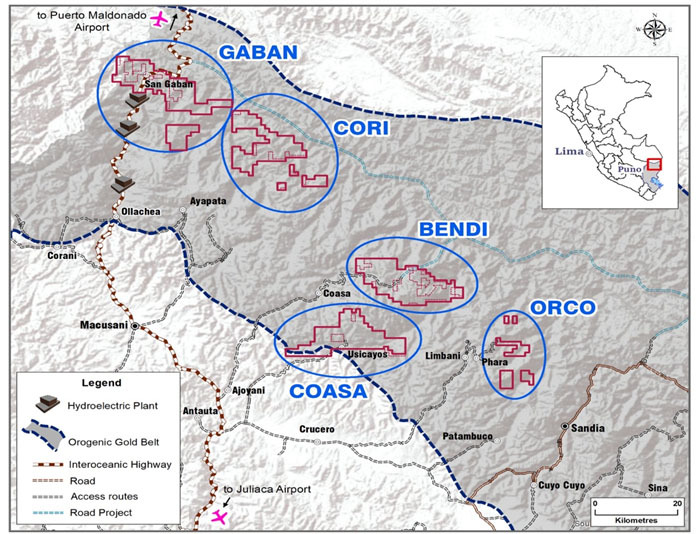 Palamina has acquired five district scale gold projects covering 77,000 hectares in the Puno Orogenic Gold Belt in southeastern Peru: Coasa, Bendi, Gaban, Cori and Orco. All five projects either have visible gold showings or there is visible gold being mined adjacent to them. There are also 100,000 artisanal miners in the belt actively mining gold driving this modern day gold rush, the company stated. Palamina Corp. initially went into Peru at the end of 2016. Management says 2017 was spent acquiring, visiting, assessing and prioritizing the land. It wasn't until 2018 that the company started systematic exploration. In late October 2018, management announced the completion of heliborne geophysical surveys over its Coasa, Gaban and Cori projects. The company noted that in the POGB, gold mineralization frequently has an association with disseminated magnetic pyrrhotite hosted by quartz veins within regional shear zone structures. Andrew Thomson, president of Palamina stated, "Palamina is the first company to conduct heli-borne geophysics in the Puno Orogenic Gold Belt (POGB). The ~3,000 line-km survey is now complete, and we are awaiting the processed data to better understand the structures of the Coasa, Gaban and Cori gold projects." While Palamina awaits the survey results, it shared news on its Gaban Gold Project and continues to advance its flagship Coasa Gold Project. The company says it holds title and application rights to 19,300 hectares at Gaban where 10 sets of alluvial miners intermittently mine coarse alluvial gold from the Yanamayo River within the property. "Geochemical stream sediment sampling has returned values up to 4.9 g/t gold (at -60 mesh) in the Yanamayo River. Palamina has secured the mining rights to 85% of the Yanamayo River watershed which is bound on all sides by four mountain ridges," the company stated in the news release. The company noted that the Yanamayo River makes up part of the watershed driving alluvial gold mineralization at Madre de Dios where alluvial miners cover over a 700 square kilometer area. As Palamina plans to spend the 2018 Christmas season integrating the geophysical survey data, it's revving up for a drill program at Coasa where permitting is expected to be in place by April 2019. The company has noted that at Coasa the focus is on the Veta Zone where gold mineralization has been traced over a 500 by 800 meter zone. Palamina reported the discovery of four visible gold zones at Veta where chip sampling returned up to 620 g/t gold and channel sampling up to 1.8 meters of 19.6 g/t gold. The company has also made a discovery in the Cayos zone, which returned 3 meters of 30.5 g/t gold. While management expects to have drill permits by April, it doesn't expect to see results from drilling until September 2019. Management notes there is still a small amount of work to be done before getting to drill targets. Two structural geologists have been busy on the project to further define the best drill targets. Palamina notes that it has been in talks with companies for potential future joint ventures on its other project in Puno. The company's management team boasts more than 35 collective years of experience on the Puno Orogenic Gold Belt. "In just the last two years alone, Palamina's board of directors and advisory board have cumulatively raised over $50 million and defined over 7 million ounces of gold on a number of projects," Thomson stated. Presently, Palamina has just under 30 million shares outstanding with roughly 40 million shares fully diluted. Palamina's stock currently sits at CA$0.39, giving it a market cap of approximately CA$11.65 million. 1) Nikia Wade compiled this article for Streetwise Reports LLC and provides services to Streetwise reports as an independent contractor. She or members of her household own securities of the following companies mentioned in the article: None. She or members of her household are paid by the following companies mentioned in this article: None. 2) The following companies mentioned in this article are sponsors of Streetwise Reports: None. Streetwise Reports does not accept stock in exchange for its services. Click here for important disclosures about sponsor fees. 3) Comments and opinions expressed are those of the specific experts and not of Streetwise Reports or its officers. The information provided above is for informational purposes only and is not a recommendation to buy or sell any security. As of the date of this article, an affiliate of Streetwise Reports has a consulting relationship with Aztec Minerals. 5) From time to time, Streetwise Reports LLC and its directors, officers, employees or members of their families, as well as persons interviewed for articles and interviews on the site, may have a long or short position in securities mentioned. Directors, officers, employees or members of their immediate families are prohibited from making purchases and/or sales of those securities in the open market or otherwise from the time of the interview or the decision to write an article until three business days after the publication of the interview or article. The foregoing prohibition does not apply to articles that in substance only restate previously published company releases. As of the date of this article, officers and/or employees of Streetwise Reports LLC (including members of their household) own shares of Palamina Corp., a company mentioned in this article.